When attending a career fair, you're a bundle of nerves. Graduation is quickly approaching, and you’re on the search for your first post-grad job. In preparation for this career fair, it’s important to think about what you’re going to be talking about with recruiters. They are going to be asking you a lot of questions about yourself, your interests, and any experience you may have - but what are you going to ask them? People with years of career experience know the questions they want to ask in an interview. After several jobs, they know exactly what they’re looking for in a company and in a position. However, identifying these types of questions comes with years of practice. As a student going to a career fair in the search of your first job, it’s important you know the right questions to ask. "Are there any specific courses that you would prefer a candidate to take?" Through these questions, you can illustrate to a recruiter your qualifications and eligibility. Fill these blanks with aspects of the organization you found during your research. Learn more about researching companies before a career fair. There’s only so much you can learn about a business or organization from their website! Think about asking questions that can give you more insight into the company. Asking these questions not only displays your interest again, but it also gives you a better idea of what it would be like to work for this company. You can decide if you would fit in well and if the position is right for you. “Do you have a business card or can I connect with you on LinkedIn?" These last questions provide a way to stay connected with recruiters if they are interested in bringing you in for an interview. Getting contact information also allows you to follow-up with a recruiter after a career fair to thank them for their time and reiterate your interest. It’s normal to get nervous when speaking to a recruiter! 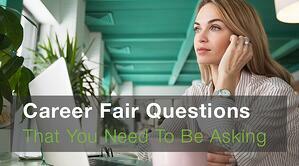 To prepare for nerves, type up your questions on the Career Fair Plus app. Having these questions readily accessible will help you be more successful!